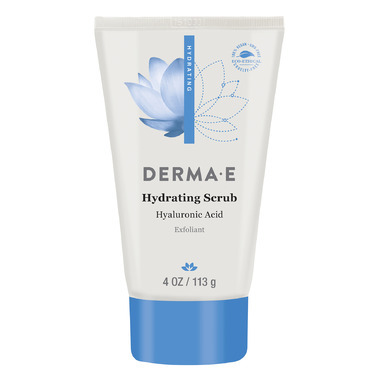 Derma E Hydrating Scrub buffs away impurities and dull surface cells while moisturizing skin with this creamy exfoliant. Hyaluronic Acid, also known as nature’s moisture magnet, promotes healthy skin hydration. Walnut Shell Powder provides gentle yet effective exfoliation, lifting away dirt, excess oils and dullness. Vitamin A encourages skin renewal, revealing smooth, vibrant, younger-looking skin. Directions: Apply to wet or dry skin and gently massage in circular motions. Rinse thoroughly with warm water and pat dry. Use twice a week. this is very good scrub. It's not too harsh and I like that it has hyaluronic acid in it.